Description Of Item: Meet the Griffins: Peter, Brian, and Stewie. 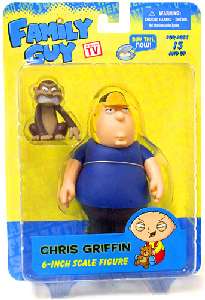 Stars of the #1 rated, Emmy award-winning hit show Family Guy! The first episode aired in 1999, and 10 years later the show is more popular than ever, with over 18 milion weekly viewers and top-rated DVD sales! New episodes air weekly on FOX TV, and syndicated episodes can be seen multiple times a night on TBS and Cartoon Network. Mezco Toyz presents six inch scale rotocast figures of the outrageous family including show accurate accessories!